At Elmbrook Family Dental, we like to give our patients options when it comes to their oral care. With regard to whitening your smile, you have the option to do it either in-office or at home-- we want the experience to be as convenient as possible for our patients. In as little as one visit, your smile can go from dull to dazzling in our Brookfield, WI office! With this form of whitening, we are able to whiten even the most stained smiles, including tetracycline stained teeth! You will be able to get a smile up to ten shades whiter in less than an hour, and the results can last for even longer with minor periodic maintenance. We also offer Zoom! 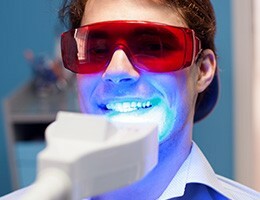 Whitening for our patients, allowing them to whiten their smile up to eight shades in less than an hour. Or, if you would rather whiten your smile more gradually, Dr. Brunner, Dr. Tailbl, Dr. Tack, and Dr. McGinn are able to offer our patients an at-home whitening kit. We will supply you with the whitening gel and mouth trays, and you’ll simply wear the whitening agent when it is most convenient for you during the day. After two weeks, you will be able to see the full results, and you will be grinning from ear to ear! If you have any questions on how we can help whiten your smile, contact our Brookfield, WI office today!